It's almost Frocktober! That’s right – it’s time to dig deep into the wardrobe, and wear a dress every day throughout October to help raise money and awareness for ovarian cancer. Right now, ovarian cancer has no early detection test. It’s our mission to change that, while being fabulous at the same time! This year’s Frocktober theme is Every Frock Has a Story, so I’m looking forward to sharing lots of frocks and stories along the way. 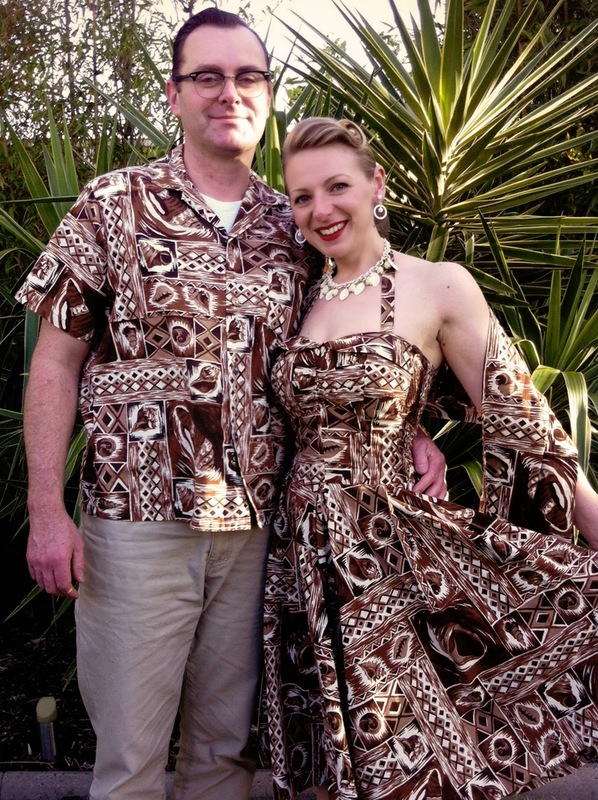 I took part in Frocktober for the first time last year, but before that, I sponsored the frock efforts of friends like Inala from Saw Thought Wore and Paula-Jane of Powderpuff Boutique. 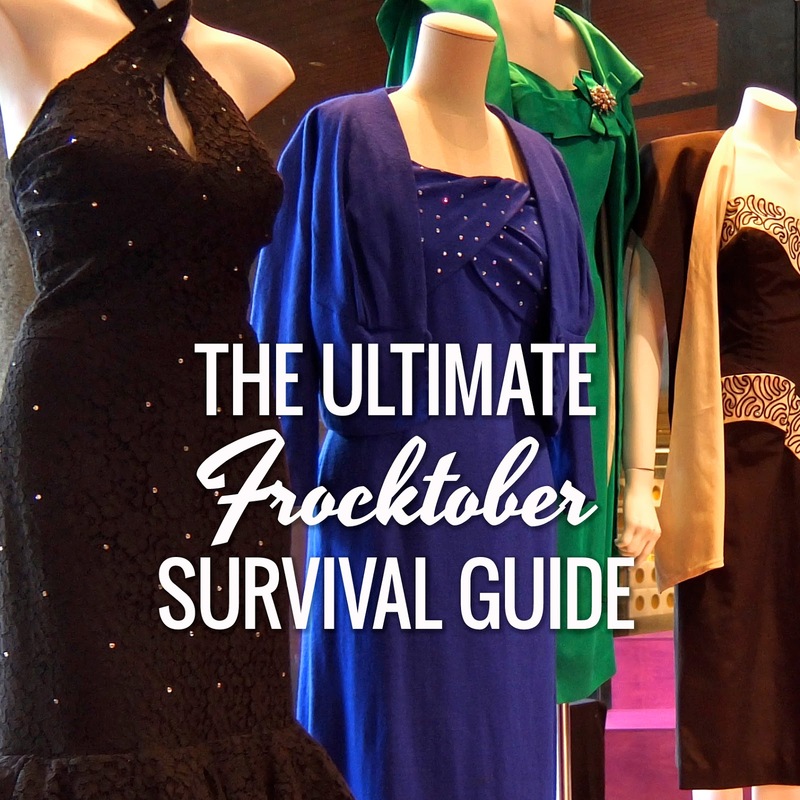 Before taking the plunge myself, I consulted the ladies for their Frocktober advice… So read on for expert Frocktober survival tips, plus my five most-liked dresses, as voted by the people of Instagram! 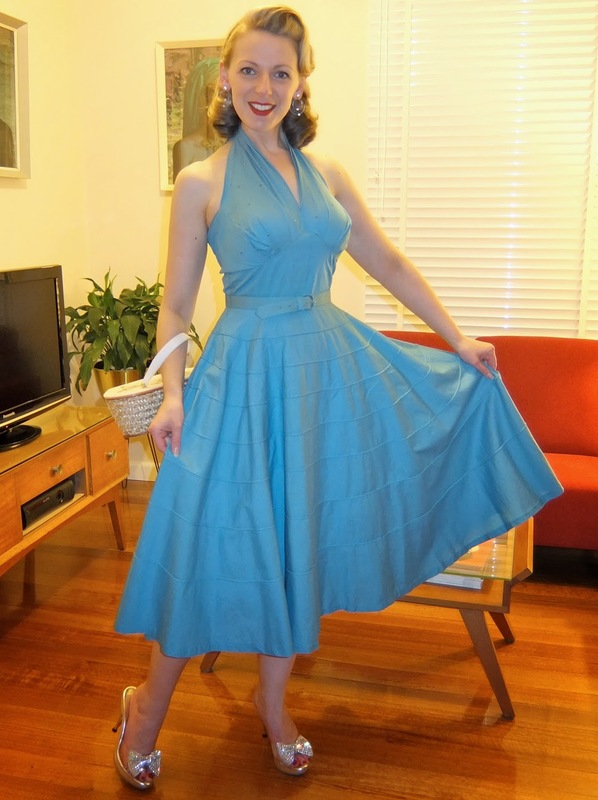 Before doing Frocktober, I thought the hardest part was going to be finding enough dresses. It’s not. The biggest challenge is keeping up with the daily outfit photos! I usually work in offices with a bunch of guys, so it can be tough to find a victim to take my photo every single day. 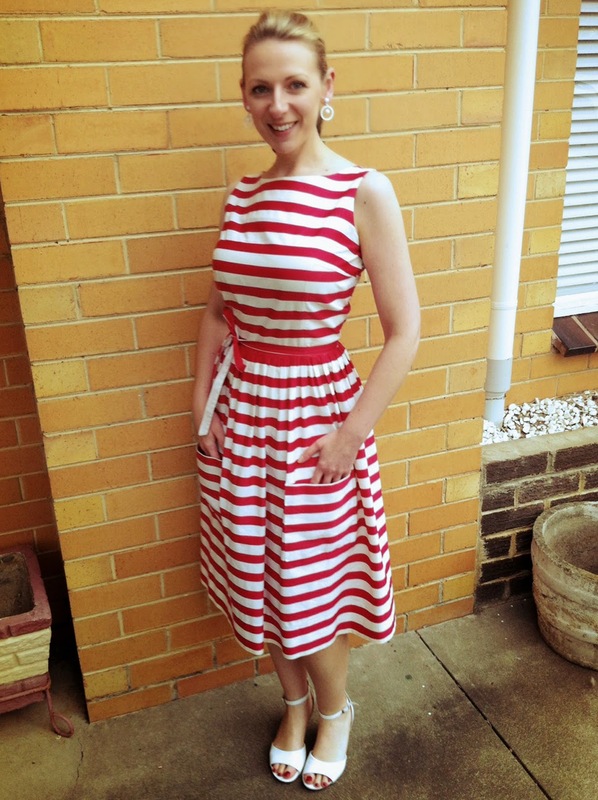 But the photos are a very important part of Frocktober, so I just had to make a nuisance of myself and get it done. You don’t want to be the person who gets caught short and then has to fake a few days’ worth of frock posts on the same day… People can tell! Before October starts, you need to delve into the wardrobe and check out what you’ve got to work with. It’s a great chance to rediscover some lost treasures and catch up on the mending pile! Once you’ve checked the lay of the land, it helps to create some kind of system. My friend Inala took things to a whole new level by doing a spreadsheet, allocating a specific frock for each day in October. My system wasn’t quite that advanced, but it was still pretty nerdy. I took a quick snapshot of each of my dresses, then turned them into a Frocktober album on my iPad. I then arranged the photos in order from the hottest weather dresses to the coldest. So in the mornings, I’d check the weather on my iPad, then browse through the dresses most appropriate for the conditions. This system totally worked for me, and I plan to do it again this year. Stock up on layering pieces. Melbourne’s weather in October is always a mixed bag, and last year it was colder than average. I didn’t have enough cool weather dresses to get me through, so I had to get creative with boatneck tops underneath, then cardigans over the top. I also wore a lot of boots and opaque tights with low-cut sports socks underneath. Nobody can tell you’re wearing socks, and your feet stay toasty warm! This year’s hot tip is Razzamatazz fleece-lined tights. They have the look of opaque tights, and the feel of tracksuit pants! If that’s not enough to make you rush to the supermarket to buy some, they’re also great to wear with shoes that rub on your feet. No more blisters with Razzamatazz on the case. Chances are, most of your sponsors will also be your Facebook friends. They’re going to want to see your frocks every day, so be sure to post pics! If you can, you should also include your sponsorship link every day. You may feel like you’re repeating yourself, but people get busy and appreciate not having to dig for the link when they finally get a chance to visit your page. On Instagram, make sure you use the #Frocktober hashtag so your fellow frock wearers and potential sponsors can find you. These are the most common questions people ask me, and the organisers of Frocktober! 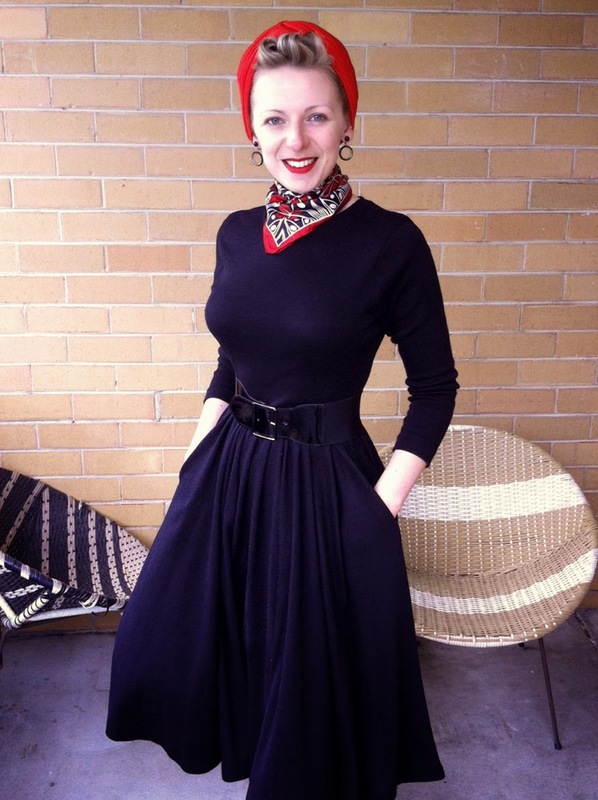 A: According to the Frocktober organisers, the answer is no. Since we’re all friends here, I’ll confess I slightly bent those rules once or twice by wearing vintage skirt and top sets made from the same fabric. They look like a frock when they’re on, but they’re actually not. I am not normally so rebellious, but I was running very short of options, since it was pretty cold last year. Q: What if you have an unscheduled day off? A: That’s okay… Things happen! Last year, I had a shocking migraine halfway into Frocktober, and there was no way I was getting out of bed to put on a frock, let alone pose for a photo. I decided to post a pic of the dress I wished I was wearing (see the red gown above) and it turned out to be one of my most popular photos. Q: I can't take part, but is there still some way I can help? A: Yes! You could host a fundraising event like a ladies’ afternoon tea at home or a Frocktober Friday in your workplace. I organised one in the office a couple of years ago, and it was so fun! We had an impromptu fashion parade, and our CEO awarded bottles of champagne for the best frocks of the day. Good times! And of course, the best way to take part is to sponsor someone! My goal this year is $1000... Can you help me get there? Great suggestions- I am taking part in my first Frocktober and definitely agree that I have had to check my layering options! It can be very cold here first thing in the morning for school drop offs, but then it gets warmer later in the day. Thanks Lauren! I've got my coats ready for cold mornings too... Good luck on your first Frocktober!